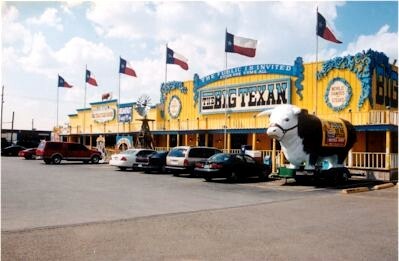 The Big Texan Steak House is famous for its 72 oz, free steak. If you can eat it / with trimmings, in one hour, it's free! Yes they do have takers on this deal. At the front of the massive dining room on an elevated stage is a table with a large digital timer. This is where contestants have to sit and gorge themselves on the 72 oz. steak / with trimmings. If you don't finish in time, you pay for your meal, all 72 ounces / with trimmings. I went to "The Big Texan" to eat lunch and check it out. I was expecting a tourist trap restaurant. It did have a lot of stuff for the Texas Tourist, but to my surprise, the steak was great, and the service was excellent. I ordered an 8 oz. fillet and ate it all up. No, it wasn't free but it was reasonably priced. The Cadillac Ranch was dreamed up and built by helium multimillionaire Stanley Marsh number 3 in 1974. Ten Caddies, ranging from 1949 - 1963 models are stuck in the ground nose first and tilted to the west at the same angle as the Cheops' pyramids. In 1994 Mr., Marsh had to move and replant them all further west because of Amarillo urban sprawl. 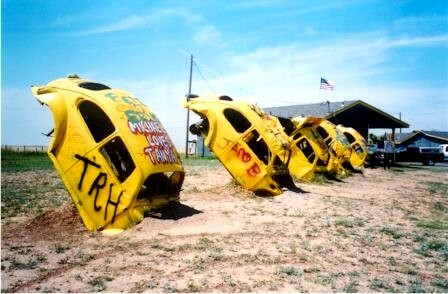 The "Cadillac Ranch " is locate a few miles west of Amarillo on I-40 in a wheat field owned by Mr. Marsh. Visitors are welcome to bring spray paint to personalize the sculpture at anytime 24/7. 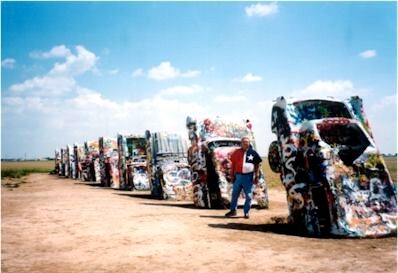 The Cadillac Ranch: is located West of Amarillo, on the South side of I-40, between exits 60 and 62. Ain't free enterprise a wonderful thing. Route 66 maybe gone but the tourist going down I-40 still have to have a reason to stop. The owner of the Longhorn Trading Post needed a gimmick to get people to stop and "surprise, surprise" the "Bug Ranch" was born. These people cars are pointed for the best view from I-40 and the angle is the exact angle that the backhoe operator found easiest. Located right next to the "Rattle Snake Ranch" it offers the a perfect photo op for those passing through the Panhandle of Texas. Can you imagine in years to come some folks will look at there vacation photos and remember Texas, the way it really is. The Longhorn Trading Post for all its gimmicks was not a bad place to stop. It provided all necessary services and refreshments at a reasonable price.